把椰奶，香蕉泥和蛋汁加入上述第二項的乾粉材料中。用膠刮 spatula 輕輕拌勻成粉糊 （見上圖 3）。倒進一不黏底的蛋糕焗盤中（見上圖 4）。焗約 45分鐘至 1小時。每個焗爐火力不同。可用一鐵針或竹簽插入蛋糕中央，若沒有粉漿黏著，即蛋糕熟透。放在鐵架上放涼後，享用。Yummy ! I don't have self-rising flour but all purpose flour, so how much flour and baking powder do i need for this recipe? Thank you. Normally I follow the recipe closely. When it calls for self raising flour, it's always better to follow through to ensure the best result. However, if you like to do some experiments, you can refer to this info page to test it by yourself. 請問, 如果不用自發粉可以嗎? 因為我不想特別為它而買一包自發粉呢. 低筋粉加發粉可以嗎? 份量多少? I used 1 cup of mashed banana in exact. The batter was very liquidy, and I had to add extra 1/4 cup of flour. 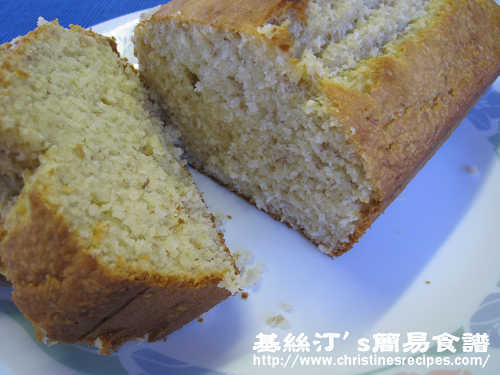 The cake was same as that of 佩玲, 粘粘实实. You've added too much flour. No wonder 粘实实. Can I use muffin cups to make this cake ? then can save some energy to bake it and faster. 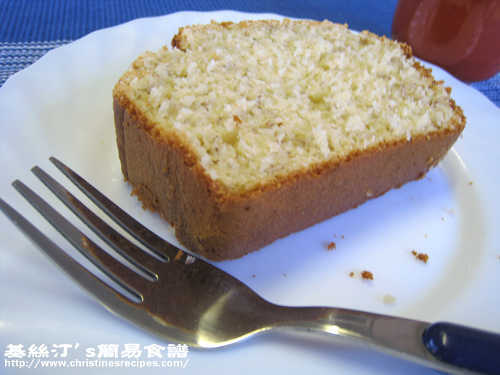 I have tried the banana and coconut cake using muffins cups. 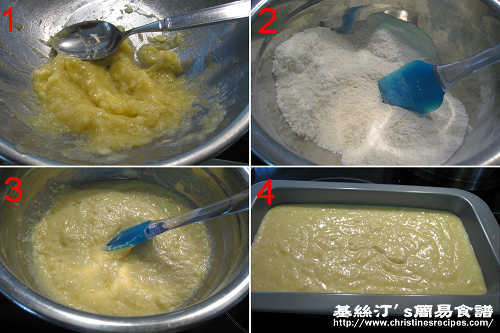 The recipe can make 12 normal size muffins and 3 mini-muffins. I baked for 16 minutes. It is delicious. Thanks for sharing. Christine妳好呀!! 我只是路過而被妳呢一個蛋糕吸引住, 我好鍾意椰汁味又鍾意香蕉, 所以停低咗嚟睇.老實話妳知, 我呢世人從未做過糕餅, 因為我份人都幾懶, 成日只有想, 但唔行動, 因為我最怕難事. 但竟然妳呢個食譜令我而改變, 因為又美味又易做, 令我立即去買材料試做, 我真係好開心, 好感激妳, 唔係見到呢個食譜咁簡單又好味, 我諗我永遠都唔會動手做糕點, 所以真係好感謝妳. Thank You Very Much! !